ROS-I is developing and promoting a manufacturer-independent open-source library of drivers and the transfer of established components from research to industry – not just h/w interfaces and MS, IOS and Android support, but legal and standardization issues as well. Interchangeability of h/w components through standardized interfaces and intelligent software components for flexible production are the benefits. With centers covering The Americas (located at SwRI in Texas) and for Europe (located at Fraunhofer IPA in Germany), ROS-I is looking for a partner to cover Asia. 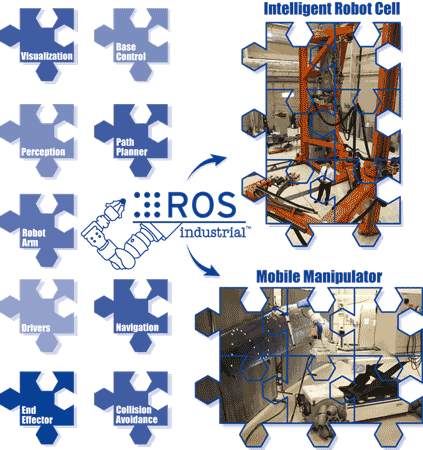 A one-year video montage shows some industrial robotics applications made possible by the ROS-I repository was founded in 2012. One can see ROS-I controlling robots by ABB, KUKA, Fanuc, Adept, Universal Robots, and Yaskawa-Motoman.